The next thing I know we are blowing the insides out of eggs and teaching a group of primary-aged children the art of batik…on eggs! 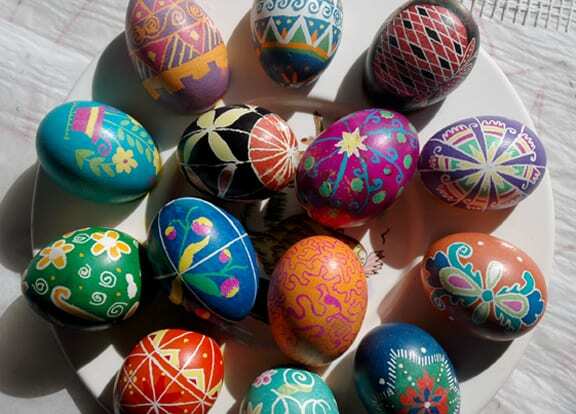 I find it interesting that the Ukrainian word “pysanky” comes from the verb “pysaty” which means to write. So picture teaching a group of 12 or so under ten-year-olds to write with wax on eggshells! Did I mention that there is fire involved in this activity? Yes, that’s right, fire. Here’s the deal: children are capable. Was this activity chaotic? You bet. But not once did it cross our minds that this group of children was too young to engage in a sophisticated craft. We rarely purchase construction paper! Looking back on this Guild activity, our apprentice students proved that focus is not an issue. Children possess an incredible store of focus power, but we deny them opportunity to demonstrate their prowess when we hand them coloring books. The art of pysanky teaches patience, true. When we help children recognize pure white shells as tiny surface of potential and then support them in the painstaking work, individuality emerges. As a teacher who’s a poet, I see a metaphor emerging.